In order to actually achieve a realistic and substantive peace between Israelis and Palestinians, a top Israeli government official has conceded that a near-total withdrawal from occupied Palestinian and Syrian territories, encompassing West Bank, East Jerusalem, and the Golan Heights, is the only viable solution to the seemingly intractable situation. He also admitted that the institutionalized militarization that permeates all of Israeli society is worthless and, in fact, destructive to any hopes for security in the region. He also called Israeli saber-rattling against a sovereign nation of 70 million people a symptom of Zionist megalomania and demonstrates a complete loss or lack of Israeli self-awareness. So who is this left-wing, pinko nut job? 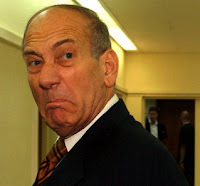 Israeli Prime Minister Ehud Olmert. Guh? Yes, it's the year 5769 and it seems like the out-going Israeli Prime Minister might be taking the upcoming Yom Kippur atonement more seriously than ever. In an interview with Israeli newspaper Yediot Ahronot on Monday, Ehud Olmert expressed regrets and ideas that, until now, have never been uttered by a prominent (if any) Israeli leader - let alone by the top executive. Whereas none of his comments during the so-called "legacy interview" could be viewed as a complete paradigm shift of policy (say, from a staunchly pro-Kadima, ethnic democracy, Eretz Yisrael stance to a progressive, humanitarian desire to see a viable, binational one-state solution prevail), the solutions and revelations opined by Olmert are profound nonetheless. After a military and political life dedicated to Israeli supremacy, Palestinian subjugation, and the maintenance and expansion of an illegal settler society, Olmert's interview took a startlingly pragmatic approach to the Israeli/Palestinian conflict. In fact, he sounded more like post-Zionist peace activist and former Irgun militiaman and MK, Uri Avnery, than the political partner of militarized right-wing ethnic cleanser Ariel Sharon - sort of. Olmert's comments are a departure (though not necessarily an about-face) from a strict policy of avoiding responsibility for the plight of the Palestinians and the lack of Israeli security held by most pro-Zionist Israeli hard-liners. His statements, as Time's Scott MacLeod puts it, "form a swan song of historical importance. Peace advocates, Israeli dreamers, Arab skeptics and U.S. mediators in a future McCain or Obama Administration should read his words carefully and take note." Such vital final status issues such as settlements and Israeli infrastructure (illegal according to the UN, Geneva Conventions, and the International Court of Justice) and land-for-peace "compromises" were discussed candidly (from a two-state solution point of view, that is), with the Prime Minister revealing,"We have to reach an agreement with the Palestinians, the meaning of which is that in practice we will withdraw from almost all the territories, if not all the territories, including in East Jerusalem and in the Golan Heights," adding, "We will leave a percentage of these territories in our hands, but will have to give the Palestinians a similar percentage, because without that there will be no peace." When pressed for a more specific indication of the territorial swap between the Israelis and Palestinians, were Israel to maintain control of major settlements on Palestinian land, Olmert said the exchange would have to be a "more or less one-to-one" ratio. This is certainly a shift towards reason, responsibility, and equality by an administration whose ideological doctrine is defined by the opposite. "I am the first who wanted to enforce Israeli sovereignty on the entire city. I admit it. I am not trying to justify retroactively what I did for 35 years. For a large portion of these years, I was unwilling to look at reality in all its depth. "Whoever wants to hold on to all of the city's territory will have to bring 270,000 Arabs inside the fences of sovereign Israel. It won't work. "A decision has to be made. This decision is difficult, terrible, a decision that contradicts our natural instincts, our innermost desires, our collective memories, the prayers of the Jewish people for 2,000 years." Perhaps more surprising were Olmert's comments regarding the Israeli obsession with its own military capabilities and strength. Of the military generals and strategists who seem content with the 60 year old policy of the methodical conquering of foreign land, violent displacement of the native population, and the establishment and defense of settlements and Israeli outposts, Olmert said, "With them, it is all about tanks and land and controlling territories and controlled territories and this hilltop and that hilltop," adding, "All these things are worthless. Who thinks seriously that if we sit on another hilltop, on another hundred meters, that this is what will make the difference for the state of Israel's basic security?" In reference to the previous Israeli threats of a unilateral and unprovoked assault on Iran, professed numerous times by Olmert himself, the Prime Minister dispelled the rumors as empty, bellicose rhetoric and admitted, "Part of our megalomania and our loss of proportions is the things that are said here [in Israel] about Iran. We are a country that has lost a sense of proportion about itself." Truer words have never been spoken - by an Israeli Prime Minister, at least. One must wonder if war criminal John McCain, upon hearing this, rolled over in his soon-to-be-grave, crying in disbelief that people might say what they mean, "Now, you don't do that. You don't say that out loud!" "Olmert is no Arab-loving pacifist. As Prime Minister, he ravaged half of Lebanon in 2006 in a military offensive after Hizballah killed and kidnapped Israeli soldiers. He has unmercifully turned the screws on Hamas-controlled Gaza. Olmert's comments reflect a profound shift toward realism among Israeli rightists, akin to what Palestinian and Arab nationalists started going through three decades ago, when Israel was in the prime of its strategic strength. The shift is evident not only in Olmert's prescription for a peace settlement, but also in his severe critique of a righteous Israeli mind-set that has turned out to be self-destructive. "'Forty years after the Six-Day War ended, we keep finding excuses not to act,' Olmert says. 'We refuse to face reality ... The strategic threats we face have nothing to do with where we draw our borders.'" Olmert even touched upon the issue of the Syrian Golan Heights, annexed and occupied by Israel since 1981, a move never legitimized by the international community. In reference to the "disputed" territory, Olmert said, "I'd like see if there is one serious person in the State of Israel who believes it is possible to make peace with the Syrians without eventually giving up the Golan Heights." Maybe this is less of a surprise than it seems. As reported by Tim McGirk in Time, Olmert, in the last cabinet meeting of his tortured tenure as Israeli PM, "told his ministers that 'the notion of a Greater Israel no longer exists, and anyone who still believes in it is deluding themselves' — suggesting that Israel will have to give up settlements built outside its 1967 borders, often on the claim of a Biblical right, if its wants peace with the Arab world." "If the day comes when the two-state solution collapses, and we face a South African-style struggle for equal voting rights (also for the Palestinians in the territories), then, as soon as that happens, the State of Israel is finished." He continued, "The Jewish organizations, which were our power base in America, will be the first to come out against us because they will say they cannot support a state that does not support democracy and equal voting rights for all its residents," thereby tacitly (or maybe explicitly?) admitting that the 41-year old Israeli policy of occupation, separation, humiliation, and Jewish supremacy in the Palestinian Territories is, in fact, comparable - if not tantamount - to Apartheid. MacLeod writes that Olmert's interview seems to admit his feeling "that Israel never went quite far enough in accommodating the Palestinians' basic requirements for peace," and that "the realism behind Olmert's change of heart is of tremendous import, summed up by one sentence: 'The international community is starting to view Israel as a future binational state.'" "Echoing views he initially expressed in 2003, Olmert reasons that without an Israeli withdrawal from the West Bank, the Jewish state faces the self-inflicted, mortal danger of being destroyed by demographics, overwhelmed by Muslim and Christian Arabs demanding political representation. Olmert fears that the international community could ultimately favor a one-state solution, thus spelling the death of the two-state partition that has been at the core of an acceptable Israeli-Palestinian solution for decades. "Time is not on Israel's side," Olmert says. "I used to believe that everything from the Jordan River bank to the Mediterranean Sea was ours ... But eventually, after great internal conflict, I've realized we have to share this land with the people who dwell here — that is, if we don't want to be a binational state." In his 2006 book Palestine: Peace Not Apartheid, former President Jimmy Carter states that "Israel's continued control and colonization of Palestinian land have been the primary obstacles to a comprehensive peace agreement in the Holy Land." It appears that Ehud Olmert has finally come around to the Carter way of thinking. But why? An attack of conscience after a lifetime of racism? Are these the desperate words of a disgraced lame duck? Now that he's on his way out, after being maligned at home and abroad and having enjoyed worse approval ratings than even his moronic American counterpart (due mostly to the clear defeat of the Israeli military by Hezbollah during the 2006 war on Lebanon), maybe he just has nothing to lose. And when you've got nothing to lose, why not tell the truth, right? "What I am saying to you now has not been said by any Israeli leader before me," Olmert said frankly. "The time has come to say these things." Unfortunately, Ehud, the time was when you were still in power and every single day for the past 41 years. As Walid Awad, a Fatah official who termed Olmert's remarks "excellent, but too late," adds, "If he believed in these things why didn't he do them when he was properly in office?"